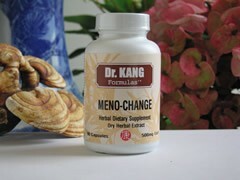 To be used as a supplement to a balanced diet during the time of menopause and its numerous side-effects. The Western scientific perspective menopause is defined as the cessation of menstruation, ovulation and the decrease in ovarian hormonal function. Menopause naturally occurs at an average age of 50 to 51 yrs due to a decrease in the pituitary LH and FSH output. With the concurrent and marked decrease in estrogen and progesterone output, the uterine and ovarian cycles cease. Menopause may be asymptomatic or may have severe symptoms involving one or more of the following. The most common symptom is hot flashes lasting less than one year (or up to 5 years for some), fatigue, irritability, insomnia and nervousness. Hot flashes at night may contribute to lack of sleep. Sometimes there are also cardiac symptoms such as palpitations and tachycardia as well as intermittent dizziness and paresthesia. From Traditional Chinese Medicine Tian Kui (Menstruation) concludes after 49 years of age. This natural process arises from a deficiency of Kidney Yin and when the Kidney loses its ability to restrain the Yang (weakness of Kidney Yang.) This leads to the loss of nutritional support for organ channels and their collaterals. In the clinical setting the practitioner can identify deficiency of Kidney Yin, excess of Heart and Liver heat, deficiency of Heart Yin and Kidney Yin, and deficiency of Yin and Kidney Yang. TCM Indications: A hot steaming sensation, fever and hectic sense due to Yin deficiency. This may be marked by a steaming sensation in the extremities, restlessness, flushing of the face, hot sensation in the upper body, depression, stress, worry, backache and knee pain, dizziness, sweat, nightmares, and dry mouth. Tongue: Red tongue with thin or little fur. Pulse: Thready and rapid pulse. This formula is directed at the relief of the primary symptoms such as hot flashes, irritability and dizziness. The formula also targets general fatigue and provides tonic invigoration. Finally, this formula helps prevent osteoporosis associated with the decline in circulating estrogen and prevents the need for hormone replacement therapy. From the TCM perspective this formula nourishes the Yin, clears the deficiency heat, tonifies the Kidney Yin and balances the Yang. In so doing it nourishes the body, consolidates the constitution and restores normal autonomic or vegetative nervous system functions.